In term of biodiversity, the coralligenous is considered as the second benthic ecosystem in the Mediterranean. It is estimated that it includes around 1700 species, among them 1300 algae, 1200 invertebrate species, in particular the well-known Mediterranean red coral (Corallium rubrum) and more than hundred fish species. The Coralligenous is the result of an edification process due to the precipitation, by several organisms such as algae of the carbonated calcium present in sea water. This process is more or less rapid depending on the season and the site. However, it is estimated that several thousand years were necessary to the edification of that ecosystem, in particular few assemblages such as the corbels of Lithophylum sp., which constitute real natural monuments. Nevertheless, except the latter natural monuments and few surface assemblages taken into account in the “Action Plan for the conservation of marine vegetation in the Mediterranean sea”, the coralligenous ecosystem was subjected, due to its too large bathymetric distribution and afferent constraints, to limited spatio-temporal studies. Its geographical distribution remains badly known at regional level. In parallel, the available studies show that this ecosystem is directly threatened by specific human activities such as trawling or the exploitation of the red coral by prohibited gears. It seems also to be subjected to indirect effects and be vulnerable to climate change impacts. These threats affect the stability of this ecosystem and strongly mortgage its future maintain. In fact, the initiative of the Contracting Parties to the Barcelona Convention must be emphasized, having requested RAC/SPA to hold an ad hoc meeting in order to propose a work programme aiming to conserve this ecosystem. As a result of the ad hoc meeting, organized in Tabarka (Tunisia), by RAC-SPA, during May the 6th and 7th 2006, back to back to the Mediterranean colloqium on red coral (Tabarka, Tunisia, May 8th-9th May 2006) the work programme was elaborated and submitted to the approval of the Focal Points Meeting (June 2007, Palermo, Italy). The creation of this Action Plan was the result of the examination process of the work programme. It was adopted during the Ordinary Meeting of the Contracting Parties (OMCP) held in Almeria from January the 15th to 18th 2008. 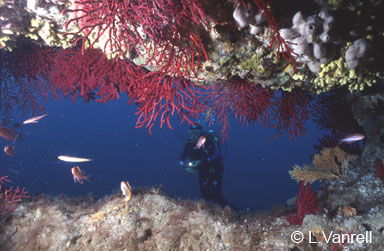 The main objectives of the Action plan is to allow the conservation of the coralligenous and others calcareous bio-concretions in the Mediterranean Sea, rising solidarity and scientific cooperation between States and increasing the knowledge concerning these assemblages, essential prerequisites in order to implement efficient management measures. To encourage the conservation of the coralligenous populations by creating marine protected areas (MPAs), notably at international waters. In order to reach the Action Plan objectives, a regional bibliographic database was initiated, you can feed it by adding your national and/or international published papers. Likewise, an inventory of specialists and institutions is on progress. Do not hesitate to introduce yourself. Finally, the first symposium on Coralligenous was held in Tabarka (Tunisia) on 15th & 16th of January 2009.